As experts in data recovery, Creative IT offers hard drive repair services in London that are based on its team’s long experience in opening hard drives in a clean room environment and replacing broken internal electronic components from hard drives. Creative IT carries out all the physical data recovery diagnostics and procedures in-house from its London based data recovery lab located near Tower Bridge road in Bermondsey in London SE1. We perform data recovery services from physically failing hard drives and specialise in data recovery from laptops, desktops, servers and raid arrays. It’s easy to tell when a hard drive is experiencing physical issues. Very often, when the drive is making unusual sounds such as clicking, grinding, bipping or squealing, it means that it’s dying and is in need of urgent repair to avoid losing the data it contains. Creative IT is able to troubleshoot the issue while you wait and give you a detailed diagnostic on the fault. A hard drive repair is needed when the drive is physically damaged and is affected by issues with internal components such as the PCB board or when the USB connector is broken. In some cases, including problems with the PCB board, an identical donor drive is required. When swapping the PCB board from the healthy hard drive onto the broken one, our technicians also take the original ROM chip and solder it on the new PCB board. 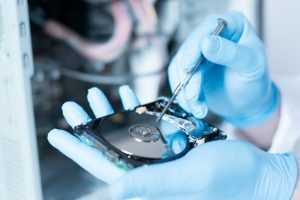 We also provide hard drive repair services when the heads are damaged in which case, an identical donor hard drive will be needed to transplant the heads to the broken drive. Get in touch with Creative IT, an ISO 27001 certified data recovery company, if you notice a problem with your hard drive and you are unable to access your data. We recover data from all makes and models of hard drives with physical faults including Samsung, Hitachi, G Technology, Western Digital, Synology, LaCie, Toshiba and many more. Our data recovery services are available Monday to Saturday from 09.00 until 18.00.